Sony S-Series Digital Camera consider as starter range of Sony Digital Camera such as Sony Cyber-shot DSC-S600, DSC-S500. Recently, Sony introduced the all new Sony Cybershot DSC-S650 digital compact camera to the market. 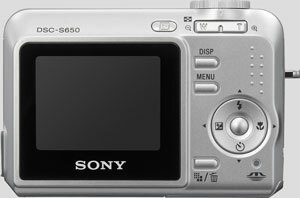 Sony DSC-S650 will feature a 7.2 Megapixel image CCD sensor, 3x optical zoom, high ISO 1000 sensitivity for low-light shooting and long battery life, up to 460 shots on a full charge of the Sony S650 model (with optional rechargeable AA battery). 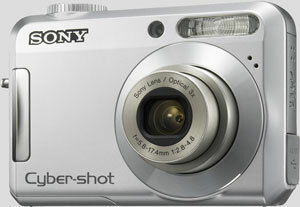 The Sony Cyber-shot S650 camera will house a 2.0-inch LCD wrapped in a silver metal body. Sony DSC-S650 still can shoot without load the optional Sony Memory Stick Pro Duo instead of it’s 24mb internal memory (not more than 10 picture with 7.2 megapixel). This model can support up to 4 gb memory so you don’t have to worry about the storage capacity during your vacation. The Cybershot DSC-S650 is so easy to use, especially in child’s play which makes it perfect for the entire family for those unforgettable memories that will last a lifetime. As conclude, one of the lowest-priced of Sony’s 2007 camera, Cybershot DSC-S650 with incredible features expect to sell in huge quantity to first times digital camera buyers.